Watching cooking shows like Top Chef, Iron Chef, and Master Chef can teach you that anything is possible in the kitchen. Weird ingredients or unlikely combination of flavors can sometimes turn into a delectable dish. Sometimes, even a kitchen boo boo can result to a new and improved version of an old recipe. Unlike seasoned cooks or chef, I am not brave enough to put my own twist in any tried and tested recipe. At least not until I tried cooking Binagoongang Baboy from scratch and double dosed the salt. My cooking skills fall under the “acceptable” level, so I normally use pre-mix flavors from Mc Cormick, Mama Sita’s, or Barrio Fiesta whenever I cook anything that calls for more that salt and pepper. My Binagoongan Baboy simply entails sautéing garlic, onion, tomato with cube-sized pork slices before adding a bottle of Barrio Fiesta Sautéed Shrimp Paste or Ginisang Bagoong. I simply adjust the taste by seasoning it with salt, pepper, and a bit of sugar. The first time that I tried cooking it using the raw bagoong from the wet market, I ended up with a very salty dish. I realized that I must have put a double dose of salt not to mention that the raw bagoong is more salty than the cooked ones that I buy from the grocery. My mom went to the rescue and advised me to add some vinegar to neutralize the salt. But after putting almost half a bottle of vinegar in the dish and it still tasted salty, we had to think of something else. It was then that my mom spied on some pineapple slices on the table and decided to add it on our dish. And Aloha! 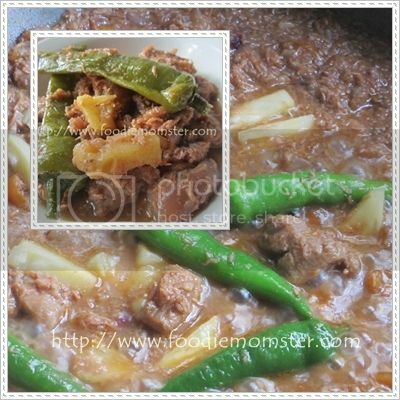 We got ourselves an interesting and appetizing twist to the classic Binagoongang Baboy. The pineapple bits were simply perfect in neutralizing the saltiness of the dish. Come lunchtime, the others were unaware that the Aloha Binagoongang Baboy we served was a result of my kitchen boo boo.